The employee in this resignation letter is departing a company due to acceptance in another retail store. 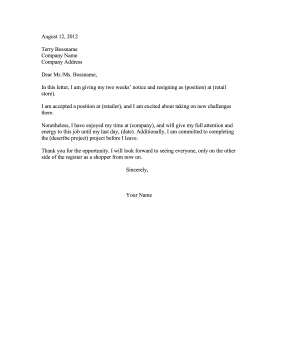 In this letter, I am giving my two weeks' notice and resigning as (position) at (retail store). I am accepted a position at (retailer), and I am excited about taking on new challenges there. Nonetheless, I have enjoyed my time at (company), and will give my full attention and energy to this job until my last day, (date). Additionally, I am committed to completing the (describe project) project before I leave. Thank you for the opportunity. I will look forward to seeing everyone, only on the other side of the register as a shopper from now on.